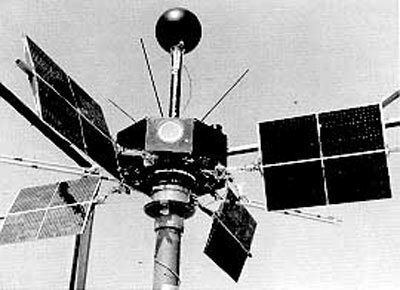 Explorer 18 (IMP 1, Interplanetary Monitoring Platform) was a solar-cell and chemical-battery powered spacecraft instrumented for interplanetary and distant magnetospheric studies of energetic particles, cosmic rays, magnetic fields, and plasmas. Initial spacecraft parameters included a local time of apogee of 1020 h, a spin rate of 22 rpm, and a spin direction of 115 deg right ascension and -25 deg declination. Each normal telemetry sequence of 81.9 s duration consisted of 795 data bits. After every third normal sequence there was an 81.9-s interval of rubidium vapor magnetometer analog data transmission. The spacecraft performed normally until May 30, 1964, then intermittently until 10 May 1965, when it was abandoned. Explorer 21 (IMP 2) was a solar-cell and chemical-battery powered spacecraft instrumented for interplanetary and distant magnetospheric studies of energetic particles, cosmic rays, magnetic fields, and plasmas. Each normal telemetry sequence of 81.9 s in duration consisted of 795 data bits. After every third normal sequence there was an 81.9-s interval of rubidium vapor magnetometer analog data transmission. Initial spacecraft parameters included a local time of apogee at noon, a spin rate of 14.6 rpm, and a spin direction of 41.4-deg right ascension and 47.4-deg declination. The significant deviation of the spin rate and direction from the planned values and the achievement of an apogee of less than half the planned value adversely affected data usefulness. Otherwise, spacecraft systems performed well, with nearly complete data transmission for the first 4 months and for the sixth month after launch. Data transmission was intermittent for other times, and the final transmission occurred on 13 October 1965. Explorer 28 (IMP 3) was a solar-cell and chemical-battery powered spacecraft instrumented for interplanetary and distant magnetospheric studies of energetic particles, cosmic rays, magnetic fields, and plasmas. Initial spacecraft parameters included a local time of apogee of 2020 h, a spin rate of 23.7 rpm, and a spin direction of 64.9-deg right ascension and -10.9-deg declination. Each normal telemetry sequence was 81.9 s in duration and consisted of 795 data bits. After every third normal telemetry sequence there was an 81.9-s interval of rubidium vapor magnetometer analog data transmission. Performance was essentially normal until late April 1967, then intermittent until 12 May 1967, after which no further data were acquired.